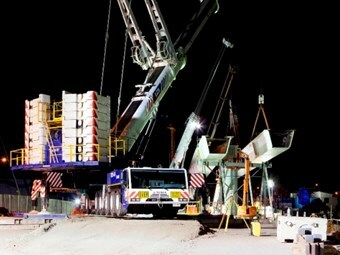 Brisbane’s Airport Link – Northern Busway project has entered the heavy duty building phase with twelve large precast beams being positioned over several nights into next week. The precast beams will be used to build the Airport Link tunnel off-ramps at Kedron at the eastern end of the Airport Link project within the Northern Busway construction zone. The twelve precast beams each up to half the length of a football field are being transported from Pinkenba, near Brisbane’s airport, along a 60 kilometre route to Kedron via the Gateway, Logan and Ipswich motorways. Kedron is just a few kilometres from Pinkenba, but has no direct route for large vehicles. Queensland Treasurer Andrew Fraser says due to each beam’s extreme length it’s not possible to transport them directly to the worksite, which is just 11 kilometres from the Port of Brisbane. Fraser says the beams are an engineering feat and have been purpose built for the elevated structures at Kedron. "Once installed, these beams will form the westbound and northbound off-ramps for the Airport Link tunnel," he says. "Careful planning has gone into this delivery to ensure the long loads can reach the Kedron worksite without any damage to existing infrastructure." Thiess John Holland Project Director Gordon Ralph says once the beams are delivered to site, work will commence to lift the beams into place creating the westbound and northbound off-ramp flyovers for the Airport Link tunnel. "The elevated structures will stand up to 10 metres high above the Stafford and Gympie Road intersection," Ralph says. "Construction of the off-ramps will be completed by installing the precast road and bridge sections on top of the already constructed piers." BrisConnections CEO Ray Wilson says Airport Link was on track for completion in mid-2012. "When Airport Link opens, it will be the first major motorway connecting Brisbane city with the airport and northern suburbs," he says. "Airport Link will revolutionise the way motorists travel around Brisbane." The projects, which are being designed and constructed by Thiess John Holland, are part of a massive $4.8 billion infrastructure investment on Brisbane's northside.